Panasonic has always been ahead of the game in the Blu-ray market, but just recently, rivals such as LG, Samsung and Sony have been gaining ground with a slew of impressive, feature-packed players. So the brand has come up with a retort in the form of a cutting-edge, state-of-the-art Profile 1.1 player. 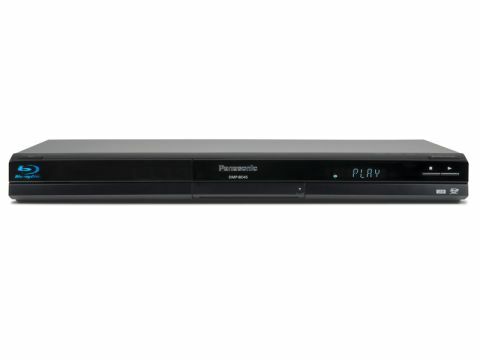 The DMP-BD45 is an entry level deck designed to give 'casual movie viewers' the chance to own a Panasonic Blu-ray spinner at an attractive price point by sacrificing BD Live support. While Profile 2.0 is not mandatory, it could be a risky move, given the ever-decreasing prices of BD Live-capable players – but not everyone uses the feature. The Profile 1.1 spec does enable you to watch BonusView picture-in-picture commentaries. We've got used to BD Live as the norm, so it's strangely nostalgic to find a deck that doesn't support it. Rear panel connections are sparse – another symptom of the deck's cost-cutting ethos. There's no Ethernet terminal, of course, and no multichannel analogue outputs for receivers without HDMI inputs. Despite its bargain price, the BD45 features the same picture processing found on players higher up the ladder. This includes the newly tweaked version of Panasonic's P4HD system, which polishes the picture and handles duties such as upscaling, diagonal processing and motion detection. It's joined by the PHL Reference Chroma Processor Plus, for a more accurate colour palette. Rounding up the features are support for Dolby True HD and DTS HD Master Audio via HDMI (bitstream and linear PCM), 1080/24p output, a range of picture presets (including the Detail Clarity sharpener) and playback of BD-R/ RE Freesat recordings made on Panasonic's Blu-ray recorders. Panasonic's bold and colourful onscreen design is easy to follow, and most of the time you can navigate without expending much brain power. You start from the Functions menu, which is organised into clear, icon-based lists. But the important setup menu is hidden in a separate submenu at the bottom, which is problematic. After selecting the option, we had to wait for the deck to handshake with our TV and receiver before the Setup menu finally appeared. It's also slightly annoying to have to stop the movie to access the Functions section, but in its favour, the main menu is clearly laid out and features an extensive array of options. The remote is terrific, boasting the same big, chunky buttons and clear, unmistakable labelling as previous versions. The fact you can use the core controls without looking is always a good sign. Sadly, disc loading isn't as impressive. Our Spider-Man 3 disc dawdled to the Sony Pictures logo in one minute, while owners of Terminator Salvation have to wait for one minute and 18-seconds to see some moving video. At least you only have to wait five seconds for the deck to boot up, thanks to the Quick Start mode. The BD45's Blu-ray pictures look sensational. With the sampling Terminator Salvation disc, it retrieves an astonishing amount of detail, lending real clarity and texture to the dusty desert surroundings of post-Judgement Day Earth. The image is solid and stable, with no digital nasties to sully those P4HD-polished pixels, and when set to 24Hz on a compatible TV, smooth movement is the order of the day. Check out the swooping jet planes tearing through the canyon. The picture also boasts mesmerising depth, thanks largely to the punchiness and solidity of blacks. Colours neither feel washed out nor garish, testament to the deck's precise colour processing. A routine run-through of test patterns on the Silicon Optix HQV disc backs this up. The BD45 doesn't put a foot wrong, skilfully keeping jaggies at bay, while switching between various video cadences with aplomb and resolving detail with scalpel-like sharpness. It doesn't matter whether you transfer them as a bitstream or PCM, Terminator Salvation's hi-res soundtrack sounds fantastic via HDMI: crisp, bassy and expansive. Plenty of subtle detail scatters from the speakers and dialogue is clearly voiced. Switch to a CD and the results are less dazzling, lacking the sparkle we've heard from pricier players, but it's not bad for everyday listening. If sound is your bag, save up for the BD85, which boasts a whole host of audio enhancements. Panasonic's decision to launch a Profile 1.1 player so long after BD Live-ready decks have become the standard is a curious one. The company argues that the market has matured to the point where it can launch a Profile 1.1 deck at a 'mass market' price to attract buyers who don't care about web downloads. Although we understand the thinking behind it, the price isn't low enough to completely justify that decision. You can find a few BD Live-capable players on the market that cost the same as the BD45, and some really outstanding players that only cost a little bit more. Given the choice, even people with no current interest in BD Live right now would be silly to deny themselves the chance to go online in the future. However if you absolutely must have a Panasonic Blu-ray player and there's a sub-£200 ceiling on your budget, then the BD45 still has a lot to offer – particularly picture quality, which is definitely up to the brand's usual high standard.